Non Disclosure Agreement (NDA), Service Level Agreement (SLA) and Term Sheet – these appears very difficult terminologies to the most. Like we made Private Limited Company, meaning of Entrepreneur, this is also a made easy guide to Non Disclosure Agreement (NDA), Service Level Agreement (SLA), Term Sheet etc. teeth-grinding terminologies. Apart from business, as a consumer we often need to know some of these terminologies. For example, Non Disclosure Agreement (NDA), Service Level Agreement (SLA) are also important when we are using Cloud Computing Services. Non Disclosure Agreement (NDA) is an agreement, which sets out the silence on negotiations, negotiation results or confidential documents. The issuer agrees information to made ? ?available to him/her will be kept secret. Unlike the trade secret, which is enshrined in law, there is contractual freedom. Non Disclosure Agreement (NDA) agreements are often used in the course of negotiations on patents signed in the process of licensing. The signing of a Non Disclosure Agreement (NDA) agreement is the drafting of the license agreement before, as this can only be done by disclosing some sensitive data. Another application of find-disclosure agreements on the acquisition or merge of companies. A non-disclosure agreement may be unilateral or bilateral, that is it may bind only one party or multiple parties. The term Service Level Agreement (SLA) means an agreement or the interface between client and service provider for recurring services. The aim is to make the control options for the customer transparent by guaranteed performance characteristics such as scope, reaction time and speed of processing which are described in detail. Important part of this is the quality of service, which describes the agreed service quality. Characteristic of a SLA is that the service provider offers each relevant service parameters without being asked in different quality grades (levels), from which the client can choose option from an economic point of view. 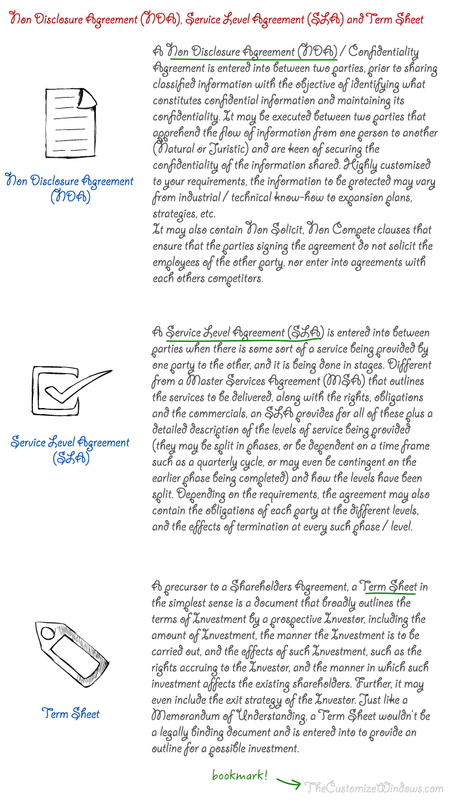 In a conventional service agreement, the service this contract design options are not offered. A term sheet implies the conditions of a business transaction, as proposed by a party. It may be either binding or non-binding. Within the context of venture capital financing, a term sheet typically includes conditions for financing a startup company. The key offering terms in such a term sheet include (a) amount raised, (b) price per share, (c) pre-money valuation, (d) liquidation preference, (e) voting rights, (f) anti-dilution provisions, and (g) registration rights. This Article Has Been Shared 6513 Times! Settings For Perfect Sound on MacBook Pro 15″ – this time not only text and screenshots but with video and real time sound with one music which is well known. Commands For Mac are one of the most useful and powerful point as for an Operating system.Not all users are used with UNIX CLI,so here is an easy guide for you. Cite this article as: Abhishek Ghosh, "Non Disclosure Agreement (NDA), Service Level Agreement (SLA) and Term Sheet," in The Customize Windows, January 9, 2014, April 26, 2019, https://thecustomizewindows.com/2014/01/non-disclosure-agreement-nda-service-level-agreement-sla-and-term-sheet/.